We are proud of first scholarship graduate, Naomi! 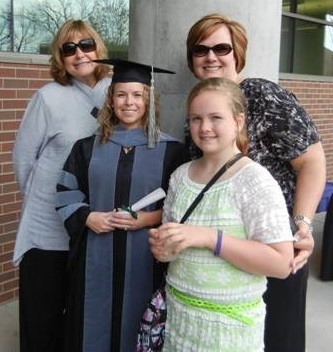 Since 2009 the Foundation has provided scholarship support for Doctor of Veterinary Medicine students at the Michigan State University College of Veterinary Medicine. The scholarship is known as the Barbara J. Brown Memorial Scholarship, funded by the Talbert and Leota Abrams Foundation. The purpose of the scholarship is to benefit worthy and capable students who have demonstrated the capacity to achieve educational and professional goals, the motivation to achieve these goals, and the initiative to seek opportunist to further their progress. Veterinary science courses have been taught at MSU since the institution’s founding in 1855. The College of Veterinary Medicine was formally established as a four-year, degree-granting program in 1910. Today, the College of Veterinary Medicine offers the Doctor of Veterinary Medicine degree program, certificate and bachelor’s degree programs in veterinary technology, as well as advanced degree (master’s and doctor of philosophy) programs. The College of Veterinary Medicine also consists of the Veterinary Teaching Hospital and Diagnostic Center for Population and Animal Health. They provide excellent training opportunities for veterinary students, and serve the public by providing outstanding care for animals and by protecting the public’s health. The mission of the College of Veterinary Medicine is to develop a diverse academic community that fosters scholarly activity and encourages exemplary human qualities in order that the art and science of veterinary medicine may be imparted to students, expanded by research, and extended to the public for the benefit of animal and human health to meet the changing needs of Michigan, the nation, and the world.